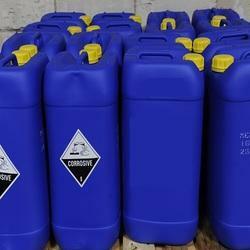 We are engaged in offering quality range of RO Chemicals. Clear Aqua formulates wide range of membrane friendly chemicals like RO Antiscalant and RO Membrane Cleaner. We are the leading Manufacturer of RO Membrane Cleaner and our product is made of good quality. Membranes lie at the heart of any reverse osmosis system, it is therefore essential that the membranes are maintained in a good clean condition and this should be considered to be an important part of any reverse osmosis maintenance program. It is essential to clean RO membranes at an early stage of fouling. It is often difficult to clean excessively fouled membranes and irreversible damage may occur during the cleaning process. Clear Aqua's M-CAPS specialty Cleaning Chemicals are effectively formulated and cleaning includes High pH and Low pH Cleaners with inhibitors. If any of the above performance parameters deteriorate by more than 30%, it may be impossible to recover plant performance by routine cleaning practices using a suitable ROC membrane cleaner.